Walking around over the last few days I have been struck by the number of yellow posters I have seen pinned up around Clerkenwell, St. Lukes and Finsbury. The posters stated ‘Keep our FHC & NHS working for us’ and advertised a public meeting called to oppose the planned closure of the Finsbury Health Centre in London EC1. The health centre was designed by the modernist architect Berthold Lubetkin in 1938. Although the demands and use of capitalised acronyms are pretty standard fare the poster also featured a drawing by Gordon Cullen. Cullen was an artist, designer and planning consultant but above all else he was an architectural campaigner who made his name by advocating the principles of the Townscape. Cullen had developed his thinking through a series of studies in the Architectural Review in the late 1950s where he used drawings and photographs to underline the importance of visual pleasure and serial vision in our understanding and appreciation of towns (and cities). Dan Cruikshank, writing Cullen’s obituary in 1994, described him as ‘a key member of that magic circle of architects, journalists, historians and poets who formed architectural opinion in post-war Britain.’ Indeed, Cullen had worked with both Lubetkin and Tecton, another pioneering British modernist company, and had painted a series of murals for the reception area of the Finsbury Health Centre. Originally the health centre had been built to provide a space for combating TB that was rife in the local population who were living in the surrounding slum housing. 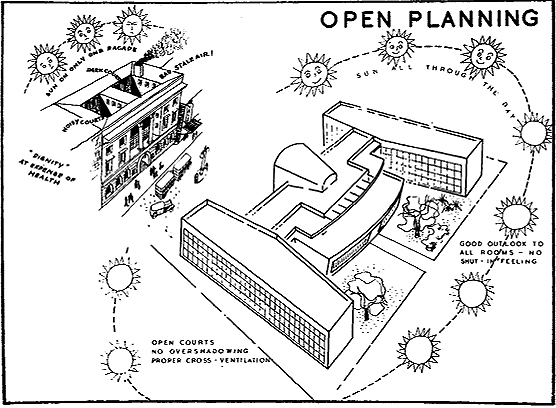 Cullen’s drawing depicts the benefits of good ventilation and exposure to sunlight that the building offered and underlines the way that modernists saw a role for themselves in shaping a better world for people as a whole. NHS Islington primary care trust has earmarked the centre for closure stating that the costs for repairs and refurbishment would be inappropriate. This has, in turn, shaped the form of opposition to the centre’s proposed closure; bringing together health centre staff, patients and local councilors as well as a fairly strong showing from architectural historians. The mix of social campaign and architectural interest is reflected both in the press coverage and the official campaign website which has a well referenced history section running alongside discussions of the future of health care. Despite widespread interest in the modernist structure, an NHS representative, quoted in the Guardian, stated bluntly that the primary care trust’s job was to ‘provide quality healthcare services in modern and suitable premises, not to look after historic buildings’. While the future of the Finsbury Health Centre is uncertain, the call from central government about the necessity for public spending cuts looks set to influence any decision made by NHS Islington. Much of the debate around the Finsbury Health Centre has highlighted the problems of current health service provision but it has also underlined the many contradictions that come to the fore when thinking about the purpose of buildings and the role that conservation can or should play in this process. Even architectural opinion is mixed on this issue. The 20th Century Society concluded in a case study report that ‘to conserve Finsbury as a monument to the welfare state does not necessarily mean that it should be conserved as a working health centre’. Citing the extremely poor condition of the building and the obvious restrictions on repairs that were voiced by the NHS the report concluded that the building may fare better with investment from an organisation or body prepared to nurse it back to life. One thing that does become clear when looking at this campaign though is the absence of any wider discussion amongst the architectural profession on how to really provide buildings that will improve peoples lives, whether this be health care, education or housing. Although filtered through the lens of the heritage industry, the fleeting reference to Cullen’s sketches and the modernist vision of a new society point to the potential for architects and critics to engage in the wider debates about the future direction of our society as a whole. Great piece, Dave. I think the way you highlight the delineation between preserving a building for its historical role versus preserving it to continue on its original role is really interesting.